Freeborn, Jeremy. "Patrick Roy". The Canadian Encyclopedia, 16 January 2017, Historica Canada. https://www.thecanadianencyclopedia.ca/en/article/patrick-roy. Accessed 24 April 2019. 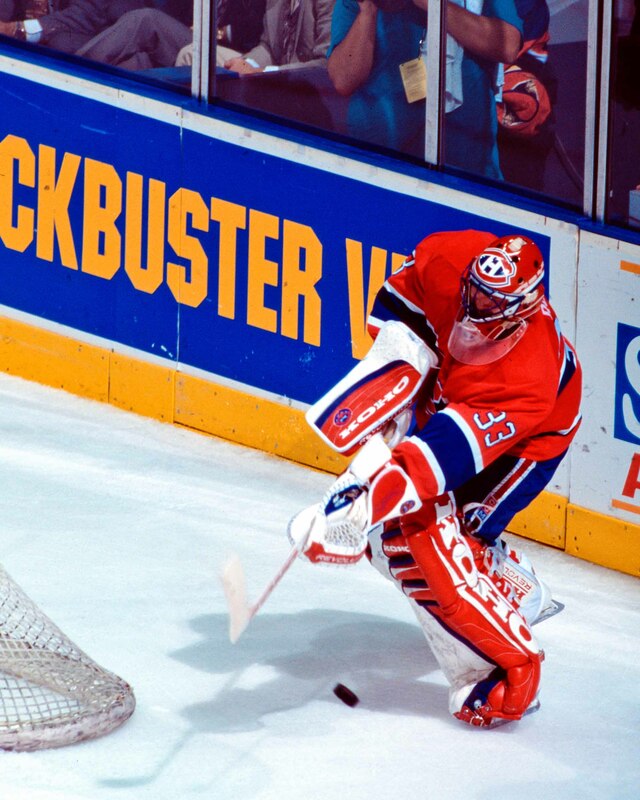 Patrick Roy, hockey player, hockey coach (born 5 October 1965 in Québec City, QC). One of the greatest goaltenders in National Hockey League (NHL) history, Roy is a three-time Vezina Trophy winner (best goaltender in the NHL) and three-time Conn Smythe Trophy winner (most valuable player to his team in the NHL playoffs). Roy played in 19 NHL seasons from 1985 to 2003 with the Montreal Canadiens and Colorado Avalanche. He ranks second all-time in career regular-season victories (551), and has the NHL record for most career playoff victories for a goaltender (151). Roy also holds the Avalanche franchise records for most shutouts in a career (37) and shutouts in a single season (9), which he set in 2001–02. Patrick Roy was the oldest of three children of Michel Roy and Barbara Miller-Roy. Michel was involved in tennis and hockey, while Barbara was a high-performance synchronized swimmer. Patrick swam as a child, and at age six, was one of the best swimmers (breaststroke) in his age group in Québec. However, he wasn’t passionate about swimming, as he found the water too cold. He also played tennis, but preferred team sports to individual competition. His grandmother, Anna Miller (née Peacock), was a devoted fan of the Montreal Canadiens and their goaltender Ken Dryden. She regularly looked after Patrick in the evenings, when his mother coached swimming. After dinner, they would listen to the Canadiens games on the radio. A true hockey fan, Patrick’s grandmother watched the 1982 Stanley Cup Finals between the New York Islanders and the Vancouver Canucks in hospital, shortly before her death. Patrick always regretted that his grandmother died before she could see him tend goal for the Canadiens, her favourite team. While his grandmother loved the Canadiens, Patrick himself was a fan of the Quebec Nordiques and their goaltender Daniel Bouchard, who gave him an autographed stick. He also idolized goaltender Rogie Vachon, who at the time played for the Los Angeles Kings. 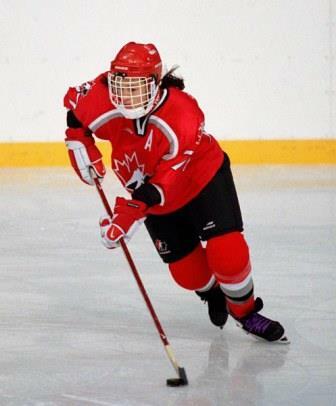 At seven years old, Roy first started playing organized hockey, as a forward, on an outdoor hockey rink run by Robert “Bob” Chevalier, who was an important figure in minor hockey in the Québec City region. (Chevalier would later become a founder of the midget AAA team that Roy would play for.) A year later, he became a goaltender for the Cléopâtres, a novice team, and at Christmas in 1973, Roy received goaltender pads under the Christmas tree. When Patrick was six or seven or eight, he was a frail kid and very skinny, not very strong. By looking at him, you’d never guess he would become a pro athlete. It is basically because of his passion for winning, passion for the game, determination, that he achieved what he has achieved. At age nine, Roy played mosquito AA for Québec-Centre-Haute-Ville (QCHV). In 1977, the team competed in the famous Québec International Pee-Wee Hockey Tournament; with Roy in net, QCHV advanced to the third round for the first time in franchise history. In the first game of the tournament, Roy had a shutout with QCHV winning 15–0. Even though his team generally struggled to win games, Roy was an all-star in his two years in Pee-Wee. 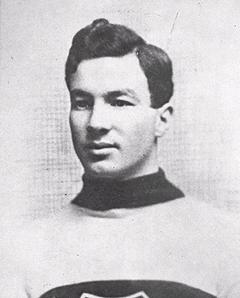 He went on to play for the Québec Citadelles and Sainte-Foy in bantam, and Sainte-Foy in midget. While with the Sainte-Foy Gouverneurs (midget AAA) in 1981–82, Roy had a record of 27 wins, 3 losses and 10 ties. The Gouverneurs allowed only 152 goals that season, the lowest in the league. Sainte-Foy advanced to the 1982 Air Canada Cup final where they lost 3–1 to the Burnaby Winter Club Travellers in the gold medal game. Roy played three seasons (1982–83 to 1984–85) with the Granby Bisons in the Quebec Major Junior Hockey League. However, the team struggled to win games and Roy’s record for these seasons was 58–86–3 with zero shutouts. Still, the Montreal Canadiens saw something special in Roy and selected him in the third round, 51st overall, in the 1984 National Hockey League Entry Draft. Roy played his first game for the Montreal Canadiens on 23 February 1985 in a 6–4 win over the Winnipeg Jets, coming into the game at the start of the third period with the game tied at four, and picking up the victory. In 1985–86, he played sparingly during the first part of the season but was the number-one goalie by the playoffs. The Canadiens had not been expected to do well in the playoffs but Roy shone in the nets and backstopped the team to a Stanley Cup championship. His 1.92 playoff goals-against average earned him the Conn Smythe Trophy as playoff MVP; at 20 he was the youngest player to ever win the award. With his flopping style Roy quickly emerged as one of the best goalies in the world, winning three Vezina Trophies in four years between 1989 and 1992. Roy again performed brilliantly during the 1993 playoffs. The quality of his play, and a record 10 consecutive overtime wins, led to another Stanley Cup championship for the Canadiens and another Conn Smythe Trophy for Roy. The Canadiens missed the playoffs in the 1994–95 season and the next season began poorly; both the coach and general manager were fired early into the new campaign. A simmering feud between Roy and recently hired coach (and ex-teammate) Mario Tremblay came to a head at the Forum on 2 December 1995 during an 11–1 drubbing at the hands of the Detroit Red Wings. 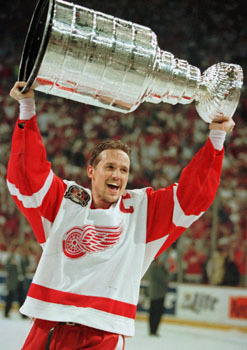 Roy allowed nine goals on 26 shots and was jeered by the crowd when he stopped a long shot by Sergei Fedorov; frustrated, he raised his arms to the crowd in a mocking gesture. After finally being pulled from the net in the second period, Roy and Tremblay glared at each other and Roy went over to tell team president Ronald Corey that it was his last game in Montréal. He never played for the Canadiens again, and was traded within days to the Colorado Avalanche. Seven months later, Roy led the Avalanche to the Stanley Cup, stopping 63 shots in a triple overtime 1–0 win over the Florida Panthers on 10 June 1996. Throughout the 1990s and beyond, as Montréal struggled to regain its former composure, Roy continued to add to his impressive statistics. On 24 April 1997, he collected the win that gave him more playoff victories than any other goalie in NHL history. Early in the 2000-01 season, Roy surpassed Terry Sawchuk’s record (447) for the most wins by a goaltender. That season he also led the Avalanche to a second Stanley Cup championship; it was Roy's fourth Stanley Cup title. He won the Conn Smythe Trophy for a third time, as he led all goaltenders with a 1.70 goals-against average and four shutouts (both playoff career highs). The following season (2001–02), at the age of 36, Roy led the NHL with nine shutouts and a 1.94 goals-against average (both regular- season career highs). In the 2002–03 season, he became the first goaltender to play in 1,000 NHL games. Roy retired in 2003 as the NHL's all-time winningest goaltender with a record 551 regular-season wins throughout his career. In playoff wins, he remains well ahead of anyone else with 151. In 2009, Martin Brodeur surpassed Roy's record by amassing 552 career regular-season wins. Roy holds the Avalanche franchise records for most career shutouts (37), and for shutouts in a single season (9), which he accomplished in 2001–02. His jersey number (33) was retired by the Colorado Avalanche in 2003 and by the Montreal Canadiens in 2008. In 1997, Roy and two partners bought the Beauport Harfangs of the Quebec Major Junior Hockey League and moved them to Québec City where they revived the Remparts. Roy was general manager of the Remparts from 2003 to 2013 and head coach from 2005 to 2013. In 2006, the Remparts won the Memorial Cup with Roy in charge. On 23 May 2013, Roy was named the 14th head coach in the history of the Quebec Nordiques/Colorado Avalanche NHL franchise. In his first season coaching, Roy won the Jack Adams Award, which is presented by NHL broadcasters annually to the NHL head coach who has contributed the most to his team’s success. In August 2016, he resigned as coach of the Avalanche. Michel Roy, Patrick Roy: Winning, Nothing Else (2007). Patrick RoyA profile of NHL great Patrick Roy.